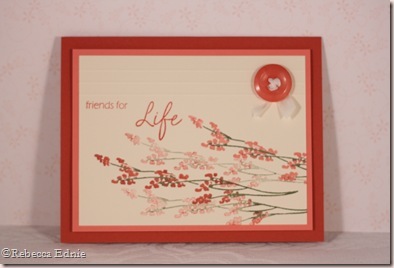 I have been so busy making crafts for the craft show I am going to I keep forgetting to blog! 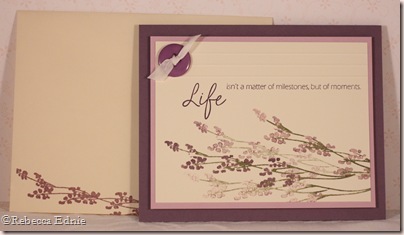 I made this set last week sometime with my new Papertrey Life stamp set. 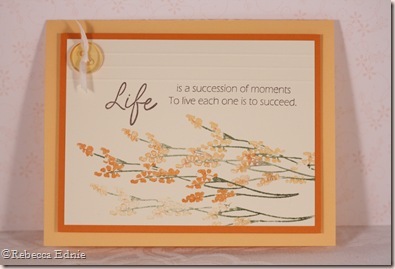 I made matching envelopes for all of the cards like the one shown in the last picture. Then I made a case for the cards. 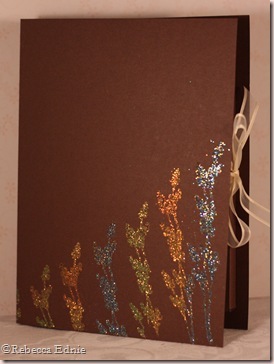 I stamped the same image with Versamark, then added heat n stick powder and three colours of glitter. I think I need to jazz this up a wee bit more. I’m just not sure what else to put on it. Anyone have any ideas? The template is one also from PTI, I think it might be one of the free ones. Ink: Versamark, chocolate, perfect plum, pale plum, coral, ruby red, pumpkin, apricot, artichoke, regal rose, rose red-SU! Paper: vanilla, CS same as ink except versamark of course!-SU! Accessories: buttons-PTI, Silk ribbon-May Arts, sheer ribbon-stash, PTI template, glitter-Art Institute, heat n stick powder-SU! These are all gorgeous Rebecca!! Good luck with your craft show! Have fun! Hope your New Year is amazing! 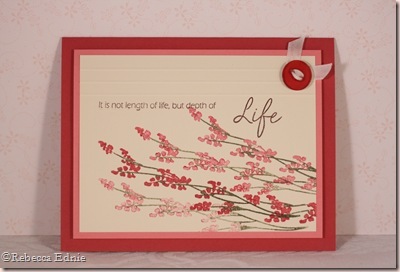 What a fantastic set – simple and elegant – maybe if this is the case for the card set stamp “Life” and die cut using several of the colours used in the set placing on the top left corner adding a button and 1 tiny part of the stamp in the corner – just a suggestion.